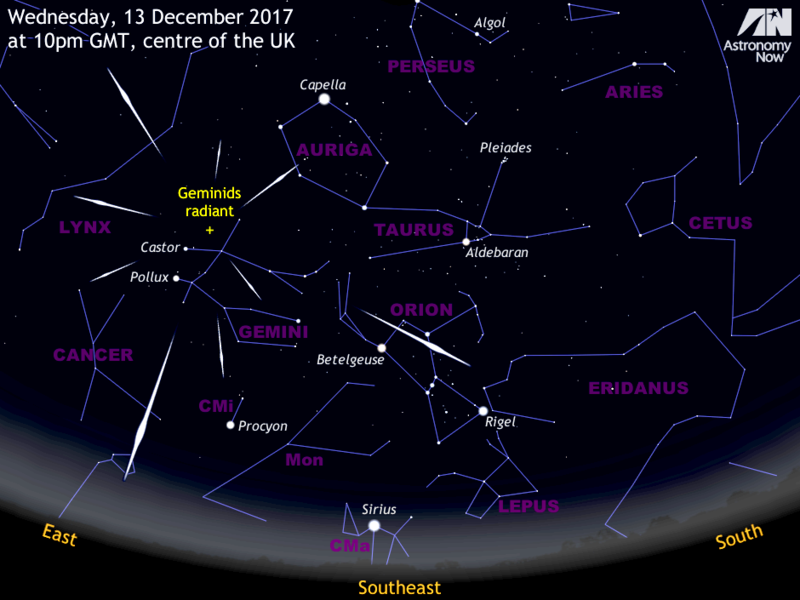 Best ever Geminid meteor shower around 14 December? The Geminid meteor shower is active from 4—17 December, but predicted to peak around 06:30 UT (6:30am GMT) on Thursday, 14th. The night of 13—14 December is largely free of moonlight since the 25-day-old waning lunar crescent doesn’t rise until shortly before 4am GMT in the UK. This year’s display coincides with a close passage of the meteors’ parent body, a “rock comet” known as 3200 Phaethon, so rates of shooting stars may be unusually high. From a dark location at the peak you could expect a meteor every minute, with a good proportion of them bright. 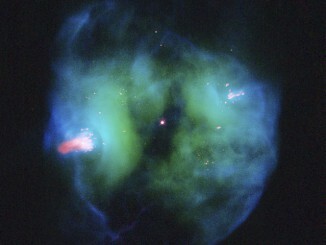 The radiant lies near star Castor in Gemini. For scale, this quadrant of the sky centred on the southeast at 10pm GMT in the UK stretches from horizon to overhead. AN graphic by Ade Ashford. Could we be in for a bumper crop of Geminid meteors just before the middle of December? There’s a good chance that we will given that their parent body, the mysterious crumbly “rock comet” 3200 Phaethon, is also making a close flyby of Earth this month. The Apollo asteroid is also visible in 10-cm aperture telescopes until around 18 December (and for longer in larger instruments) as described in a companion observing guide. Of the three great meteor showers of the year — the January Quadrantids, the August Perseids and the December Geminids — the latter is probably the most reliable. Under optimal conditions away from sources of urban light pollution and moonlight, you could conceivably see up to 120 shooting stars per hour at the time of peak activity. The Geminid shower offers a high proportion of bright naked-eye events, but these medium-speed meteors don’t tend to leave persistent trains like the August Perseids. This is due to the rocky nature of the Phaethon debris compared to the somewhat fragile icy material from Comet 109P/Swift-Tuttle forming the Perseid stream. The Geminid radiant (the region of sky where the shooting stars appear to originate) lies near Castor in the constellation of Gemini, the upper star of the celestial twins for Northern Hemisphere observers. It rises in the northeast as darkness falls in northern temperate latitudes and lies highest in the southern sky around 2am local time. The radiant remains above the horizon throughout the hours of darkness in the UK. But even from the Southern Hemisphere, where the radiant rises around local midnight, observers can still expect to see several bright events. Predictions indicate that the peak will occur around 6:30am GMT on 14 December for the UK, which is late into the evening of 13 December for central North America, or shortly before sunset on 14 December for Australasia. However, meteor rates are still likely to be high on nights adjoining the maximum, so one should make the most of any clear skies near the 14th. If you can stay up, the brighter meteors tend to peak around midnight because we are then facing the direction the Earth is moving in its orbit and the relative speed of particles entering our atmosphere is greatest. 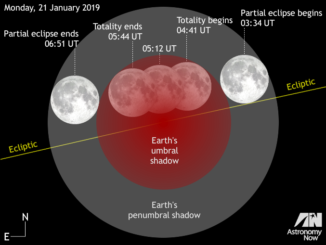 For observers in the British Isles, astronomical twilight fades to dark around 6pm GMT on 13 December and the sky remains dark until moonrise shortly before 4am GMT on Thursday, 14 December. The faintest meteors are the most plentiful (and predicted to be most abundant almost a day before the peak), so to maximise your chances you should find a safe location that is as far removed from streetlights and other sources of light pollution as you can and allow at least 20 minutes for your eyes to become fully dark adapted. Northern Hemisphere observers should ensure that they are dressed in multiple layers of clothing with warm boots or shoes, gloves and a hat, since a large proportion of heat is otherwise lost through the head. A thermos flask of your favourite hot beverage and a lounger chair is a good idea as you’ll be still for long periods during your vigil. Observing in company is always more fun too! Don’t concentrate on the radiant but at a point about 40 degrees (or twice the span of an outstretched hand at arm’s length) to one side of it and about half way from the horizon to overhead. Fingers crossed for clear skies! While truly massive stars go out in a blaze of glory, intermediate-mass stars — those between roughly one and eight times the mass of the Sun — are somewhat quieter. Such stars eventually form cosmic objects known as planetary nebulae, so named because of their vague resemblance to planets when seen through early, low-resolution telescopes. 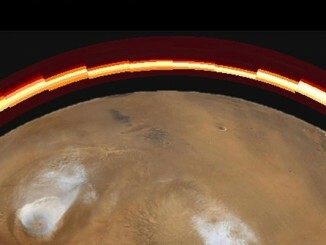 A comet that flew close to Mars showered the red planet with fine cometary dust, according to observations by a trio of spacecraft.